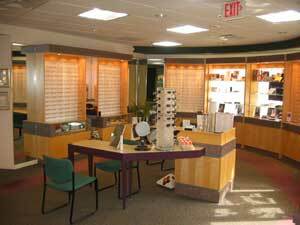 You will love selecting new glasses in our beautiful large optical department! We have over 1,200 frames on display, in all the latest designs, including many name brand sunglasses. Our highly trained staff of opticians will answer all your questions about the various types of lenses, and they will make sure you have a perfect fit. We have patient-friendly policies and your satisfaction is guaranteed. All eyeglasses carry a 1-year no-fault warranty. Our on-site laboratory allows us to provide very fast service and the highest quality workmanship. All glasses are thoroughly inspected for quality control and prescription accuracy before they are dispenses. We are participating providers for Medicare and for many major vision plans such as VSP, click logo for a detailed list.